One of biggest mysteries about the Amazon marketplace is just how big it is. Amazon has been publishing the marketplace share of units sold metric for years, it is at 50 percent now. They have also said that 100,000 sellers have sales greater than $100,000/year. But this doesn’t reveal how many sellers are selling on the marketplace in total. The “more than 2 million sellers” figure thus since then has become the quoted marketplace size. Every article talking about Amazon to this day refers to the 2 million figure, with some increasing it to 3 million. The thing is, today there are at least 4 million sellers. Likely as much as 5 million sellers, assuming that roughly 100,000 new sellers join every month. But just like the 2 million figure from 2015, this is a meaningless metric. It counts the number of marketplace sellers on the platform, not the ones to actively sell or at least have products listed. The ratio of new sellers who end up selling for a while is very low, at best 10%. Currently there are 478,016 sellers wordwide with a review in a month. One way to look at the size of the market is to analyze how many of those millions of sellers had at least one feedback review in a month. Of course some sellers end up with no reviews even after having a few sales, so this undervalues the market. 1,181,342 sellers received at least one review in a year. In an attempt to increase the size of the pool, the feedback review window is increased from a month to a year. This catches all sellers who had at least some activity during a year. Many other marketplaces define their active sellers base with a similar metric, for example the Etsy’s Number of Active Sellers. Today 1,609,404 sellers have products listed for sale. From a single product, to millions of them. This is an indication of sellers who have made some attempt to have sales, but it does include many sellers who have products listed for months or years and never have any sales. So the true market size is… it depends on the metric chosen. 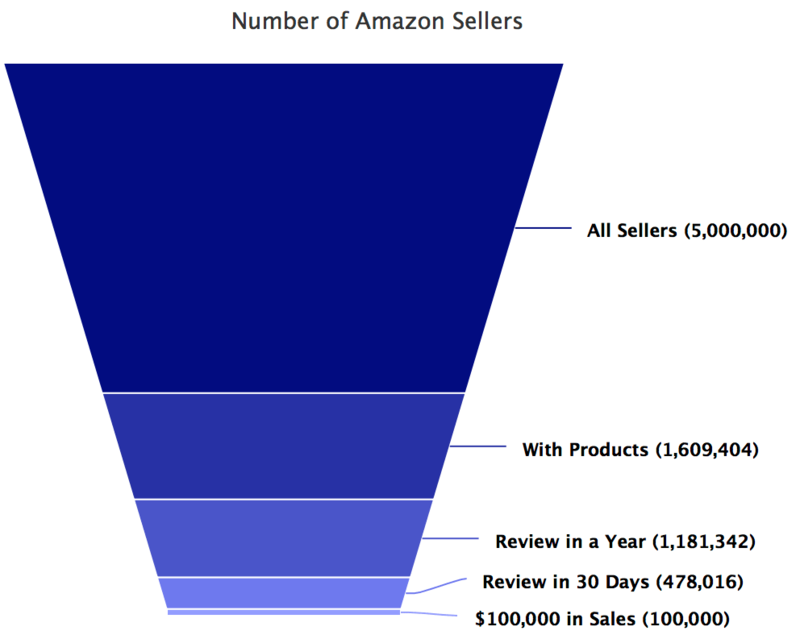 We think the Amazon’s own 100,000 sellers with at least $100,000 in sales is the most relevant. There are many more sellers with products, there are plenty of sellers who had a few sales, but ultimately what matters is how many of them have built a sustainable business out of this. The $100,000 sales figure is a good cutoff point to start counting. As far as most sellers are concerned it doesn’t matter who are the millions of other sellers. Their competition is in hundreds of thousands of sellers at best, likely much smaller. Like most markets, the sellers are distributed in a hockey-stick distribution - 80% of sales are generated by 20% of top sellers. It gets even more concentrated in niche categories.